Learning to sing grace before lunch. At Camp Carew, We seek to help people deepen their awareness of God, each other and the natural world by providing a camp program and a setting in which personal growth can take place. Our hope is that campers will strengthen their own sense of personal worth as well as their relationship to Jesus Christ and to others. All of our activities at Camp Carew are directed toward Christian fellowship and community. Each Day Camp runs from 9:00am to 4:pm Monday through Friday. These camps are for children who will be in kindergarten, first, or second grade in the Fall. Camp activities include swimming, hiking, games, crafts, Bible study, and lots of FUN! Campers will need to be dropped off at 9:00am and picked up at 4:00pm each day. Each week of camp is $150 per child. Scholarships are available. Please note: the health profile section of the online registration process contains a download of a document that needs to filled out by your physician. You may then scan and upload this form to the website or bring it with you to camp. You may also make your payment securely through the CampDoc website. Here are the answers to the most frequently asked questions about registering online. 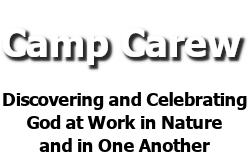 If you have further questions, You may call the CampDoc office at 734-636-1000. Camp Carew welcomes campers from all religious traditions. Camp Carew is a drug- and alcohol-free environment. Working on a craft project at Camp Carew. An art project decorating/personalizing hats. Teaching and Learning at Camp Carew.